Love Your Goggles | Mediterra - Swim & Run Better Than Ever! Do you love your goggles? 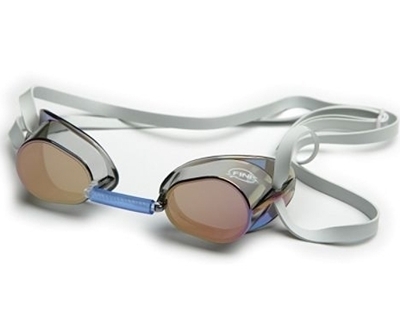 Do you love being able to see clearly and comfortably when you swim? It may sound like an obvious thing, or it may sound like no big deal. But care for your goggles is care for your eyes. It is a serious bummer to have the goggles fail in the middle of a swim, isn’t it? We start to realize how much we rely on our sight when we don’t have it. You should fully test out your goggles under the conditions you intend to use them when it matters most. And you should take good care of them between practice and races, regardless of the price, as if they were a piece of delicate, expensive equipment. 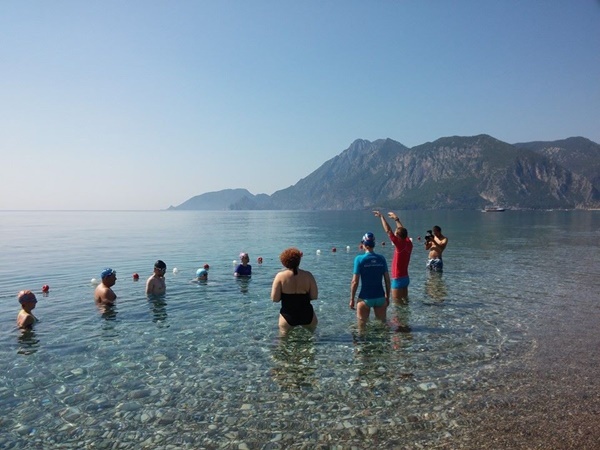 First morning training session of our open-water camp in Turkey. Rough setting, eh? I was prompted to write some advice about this because it has happened several times in our swim camps that someone has experienced a problem with their goggles after going a ways on a longer swim. But I realize prevention comes with experience so let’s share some of that experience to speed up the learning curve. Now, these failures may not be a big deal when they happen at the pool in practice and you happen to have a spare pair in your bag (… and you do have a spare pair in your bag, don’t you?) But in a race, or away from shore, that spare pair isn’t available. What then? When you enter a race with those same goggles, or go on the exercise holiday and are enjoying a long swim in the deep blue, you can’t afford to have them fail on you. Yeah, you’ll survive but it really makes for a frustrating race or an unpleasant swim. Goggles may be regarded as relatively cheap – or at least that is the way I see many people treat their goggles – throw them in the swim bag to slosh around with whatever else is in there, lay them directly on the rocks or sand, wipe them out with a soiled corner of clothe or finger, etc. Yet when we find ourselves out in the water a ways from our start/finish point and our goggles are failing us, we start to really appreciate protected eyes and clear vision, and wonder how these goggles suddenly become so troublesome. When that failure happens from our own neglect we should take note and better care. Now, I have always loved rugged and cheap gear – especially stuff that is going to get used hard and I might have to replace it often, like swim suits. I formerly felt this way about goggles. But I reflect back and see that I am habitual about caring for my gear – especially my goggles – and mine seems to last an unusually long time. I am now willing to invest in a more expensive pair if it will increase reliability and comfort. I observe that most swimmers experience avoidable goggle failures. It may seem astounding but I have not had an immediately unsolvable goggle failure while swimming in many years. However, I still prepare for this possibility, because it is always a possibility regardless of how well I take care of them. Prevent failure (or lower the risk). Keep a spare pair in your swim bag – preferably the same kind as the ones you love and use. Once you know your favorite goggle type, buy at least two pair at once. Keep extra straps and nose pieces in your bag (salvage good parts from old pairs). Practice swimming without goggles on – just in case you need to. Test the feeling of pool water and wild water on your open eyes just so you know what to expect and practice some ways to deal with it. In open-water if being escorted by kayak or boat, keep a protected extra pair with your survival gear (water, snack, sun-screen, etc) on that support vessel. Always place goggles on a soft surface (towel, shirt, etc), lens facing UP. Always store your goggles in your silicon swim cap or protective case. Rinse them in fresh water after use, wipe drops from outer lens and let air dry (along with your swim suit). Inspect the straps and plastic parts for cracks or wear spots – replace parts or replace goggles BEFORE they fail. With dish soap, wash the pool chemical residue from the body and strap often (use an old soft toothbrush). 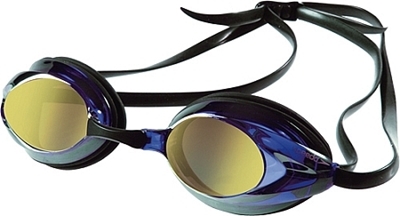 Use the same goggles in practice that you intend to use in the race or long swim. If possible, kindly refuse to share your goggles with someone else – it is not likely that others will treat yours with the care you do. Slip your goggles into your silicon swim camp before putting that into your swim bag. The soft, clean, thick cap protects the lenses from getting scratched. Or, take a firm plastic water bottle and cut off the top, with a little of the taper remaining, and store your goggles in that, inside your swim bag. I strongly advise that you never use new equipment in a race or long (unassisted) swim. (I wrote some about this in the post – Preparing For Your Open Water Race.) You should test the durability and comfort of your goggle seal in practice as you intend to use them in open-water. If you plan to go for an hour-plus swim on a swim holiday or race, then you should wear your goggles in practice for over an hour without removing them to see how it will feel after so much time, and if they will start to leak under such swimming conditions. Thoroughly test the gear you intend to use on the big swim so there will be no unpleasant surprises for you when are in the middle of it. When I buy a new pair of goggles and it says it has an anti-fog coating on it, the first thing I do is carefully rub off this coating with dish soap and a soft clothe. It may be fine for a few days, then it may not work so well. When it wears off in places from trying to rub it clear with your finger it may further obscure the clear view. My tried and true solution is to coat the lens with baby shampoo. I have the application technique dialed in and I can rely on it during long swims. They key is to leave the thinnest moist film of shampoo-water on the lens, put those goggles on, and don’t take them off for the remainder of the swim. Once you rinse the solution out, or let the lens dry and you have to reapply. But otherwise, I have had this work for me up to 3 hours continuously with NO fog at all. (I am searching for the ideal tiny ampule container to store a few drops of soap that I can then tuck into my swim suit, just in case I need a cleaning mid-swim). Before a race, I clean my goggles really well and inspect. But I don’t apply the shampoo yet. At the line, while waiting for the start I keep a very small piece of moistened kitchen sponge soaked in baby shampoo-water under the seam of my suit. I pull that out a half minute before the gun, apply to my goggles, put the goggles on and leave them on – then pray they don’t pop off during the jump in. There are techniques for lowering the risk of goggle loss at entry too. Lastly, here are my favorite goggles, just in case you wanted some ideas. However, goggles are a matter of personal fit, so hopefully you can test a friend’s goggles to feel them before you take a risk to buy a (more expensive) pair. I just started using these. I needed some goggles for longer swimming (1+ hours) that fit outside my eye sockets to reduce soreness from extended pressure. The swim-mask type just do not sit well on my smaller face (yes, I even tried womens, childrens, and a few different brands). So far, these Vipers are sitting on my face well, no leaks and nice wide view. I feel like the big lenses are really vulnerable to scratching but it will be a test for my goggle-protecting habits. I have been using these for several years, in a variety of colors (I use the womens version because they are slightly smaller). They set well in my eye sockets, and a pair will lasts me easily over a year. The only near-failure has been in the plastic nose pieces, but I inspect and replace it (with the included spare, in multiple sizes) when I notice a crack or wear spot from bending. The straps are tough and easily adjustable. Beware though, that nose piece is a bugger to change and risks breaking the goggle. That is a name of the type of goggle, and are made by many companies. I have loved these since high school. They are both durable and cheap. But they take getting used to because they fit snugly inside the eye socket with no padding – your skin in the padding, and that may be the secret to their leak-proof success. When trying a pair, give it a week because it feels like the face needs a few days to mold to the goggles – but if after a few days they feel great and you have no leaks, you may become a Swedish Goggle lover too. But if not, they may not be for you. They are cheap enough to buy and test out. I wouldn’t use these for longer swims (more than 30 minutes), but in the pool where one would pull them on/off periodically or for in-water coaching, they are great. And, you can crank them down and dive in from the blocks in a pool race with probably the least risk of loss of any goggles – they have extremely low profile. That may be a reason you see these on many Olympic swimmers in the big races. Because they are cheap, they beg neglect though. They are light and scratch easily which quickly renders the lens obscured. But I would buy a handful of them in many colors and change around – I liked the way I could change goggles to associate different intensity levels of swimming with a different color lens (for a fun experiment). © 2015 – 2018, Mediterra International, LLC. All rights reserved. Unauthorized use and/or duplication of this material without express and written permission from this site’s author and/or owner is strictly prohibited. Excerpts and links may be used, provided that full and clear credit is given to Mediterra International, LLC and Mediterraswim.com with appropriate and specific direction to the original content. And just to emphasize that we are all different, I’ve worn my (yes, very beloved) Swedish goggles for all my swims, the longest being 1hr 50min, without any probs whatsoever. In fact, I experience that the longer I have them on, the less aware I become that I’m wearing goggles. Hi Christian! It’s been years since I have tried Swedish goggles in open water, or for longer swims but you’ve inspired me to try it again. Also, the white (latex?) straps on the particular type I often buy seem to start to ‘melt’ (from repeated exposure to chlorine or some soap in my bag perhaps) after some months and leave a sticky, un-removable mess on the goggle plastic. A kind with a strap of other material may not have that problem. I use a bungee cord for my Swedes. They are easily adjustable and last forever. The key to Swedes is to not wear them too tightly. Hey John, thanks for your comment. Yes, I’ve noticed that the rubber cord that comes with many of the Swedish models ‘melt’ or disintegrate after a couple months. So a synthetic replacement cord should last longer. Although I have felt slightly annoyed by the round cord – a flat band of some sort would lay flatter against the head. A very small concern however. I think I just recreated the problem one of my swimmers had. I was wondering why, after 40+ minutes of swimming she suddenly started to have goggle problems in the sea – obviously something failed in the goggle or something changed in the structure around the goggles. The other day, while I was swimming along in the sea, I turned my head and got water leaking in. It took me a few more strokes to figure out what happened, then I noticed that I was squinting as my eye turned up toward the sun and that was enough to break the seal against my skin and let water leak in. Now, I am paying attention to moments of unnecessary facial tension when I turn my head up toward the air – I never noticed it before but now I am starting to catch occasional contortions in my face and realize they don’t need to be. So, ‘Keep the Face Relaxed’ is a new focal point on my turn-to-breath. The baby shampoo works fantastically! Thanks I had a really bad problem with fogging goggles! I’ve been using baby shampoo for so many years that I’ve forgotten where I learned it. But it is great and cheap. And I hope that the fact it is allegedly harmless to babies mean it is harmless to my eyes also! I have Noticed that some Swimmers just Spit on the Lens and wear it !Will the Saliva help? What about possible Bacterial Infection in such cases ? I know many people lick or spit in their goggles to keep them clear – but I also notice these people licking their goggles every so often. Whereas, once I apply and rinse with baby shampoo I never have to clean them again during the swim (if I keep the goggles on the entire time). So the shampoo cleaning represents a full-time solution, where spit provides a few minutes. Perhaps some people have super-spit which lasts longer? I don’t know. The Blog is real eye opener for me !In fact I was abusing my Goggles in all the ways you have mentioned ! And now I know… shall be more careful in future and Guide others tooabout proper upkeep ! Thanks for Sharing !